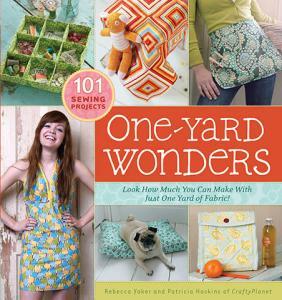 "Talk about quality and quantity, One Yard Wonders is an impressive volume of super creative projects all utilizing our favorite scraps and a simple yard of fabric. This book is a keeper!" Amy Butler of Amy Butler Designs. Great fabric demands to be purchased, even if it's just a yard or two at a time. This book presents a delightful array of simple, stylish projects that can be made with just a single yard of fabric. Projects have a hip, contemporary flair, and most can be completed in a few hours. For each project, the book provides a full-color photograph, easy step-by-step instructions, and simple illustrations. Templates and pattern pieces are also included wherever needed, making this collection of 101 projects the best sewing deal ever.